Cancer is caused by uncontrolled growth cells. Increase in the number of growth factor receptors and unregulated signaling by these receptors accounts for many cancers. VHH directed against growth factor receptors are excellent tools for cancer research and diagnostic. 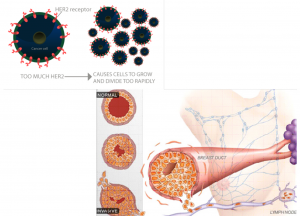 Due to the small size of the VHH, they distribute deeply and evenly throughout solid tumor, whereas larger antibodies only reach the boundaries of the solid tumor. Conventional antibodies directed against the growth factor receptors have proven efficacy in the treatment of some cancers and are used as treatment. When these antibodies or fragments thereof were assayed for imaging, they appear to have several weaknesses. Conventional antibodies have a long residence in the body resulting in less contrast and imaging is only possible after several days, while VHH are cleared extremely fast leading to same day or next day imaging. Tumor on the right shoulder was clearly labeled with 11A4 within 1 hour post injection compared to Trastuzumab but the contrast was bad due to the high label present in the circulation. At 4 hours p.i, staining of the tumor was clear and most of the label was excreted through the kidneys. Specific imaging of the tumor with Trastuzumab was reached at 72 hours p.i while VHH was completely cleared from the mouse. Since VHH are small they are reach a faster imaging with high contrast through fast excretion of unbound label. VHH also penetrate throughout solid tumors much better than conventional antibodies, which only stain the blood vessel-rich boundary of the solid tumor [Oliveira et al, 2011](Fig. 3). QVQ has developed several VHH directed growth factor receptors: EGFR (Erb1) (Oliveira, 2012), Her2 (Erb2) (Kijanka, 2013) and Her3 (Erb3). QVQ has also developed VHH directed against markers related to hypoxia environment, which arises within solid tumors and which is an indication of malignancy of the tumor. The markers are HIF (hypoxia induced factor) (Groot, 2006) that drive the expression of several genes, including CAIX (Van Brussel, 2015) , which is a good example of a hypoxia induced marker, next to a marker of renal cancer. QVQ has also developed VHH directed against markers involved in metastasis of primary cancer cells, such as cMET (hepatic growth factor receptor) (Heukers, 2014) and CXCR4. Figure 1: Schematic drawing showing breast tumor developing through amplification of Her2. Uncontrolled cell growth of breast duct leads to invasion of the lymph vessels and metastasis. Figure 2: In vivo imaging of a Her2-positive xenograft of SKRB3 cells with VHH (11A4) and conventional antibody (Trastuzumab) labeled with NIR dye. Figure 3: Penetration of VHH (7D12) and conventional antibody (cetuximab) labeled with NIR dye into a human EGFR-positive xenograft. Isolated xenografts showed uniform staining with VHH 2 hours post injection while conventional antibody stained the xenograft at the ridge 24hours post injection. IHC staining shows that cetuximab is mainly located next blood vessels, while EGFR is abundant on the tumor as showed by exvivo incubation with cetuximab.